On a walk through Dublin City centre on Saturday around lunch time I came across three very different protests within a space of less than 500 meters. The political vibrance of Dublin is one of the reasons it's my favourite city in the world. I took these pictures because I had a feeling Gubu World readers would enjoy. The first protest, naturally was outside the GPO on O'Connell Street. The GPO has a certain psychological impact on the Irish people because of its connection with the 1916 Rising and as a result it becomes the focus point of most demonstrations in the capital. 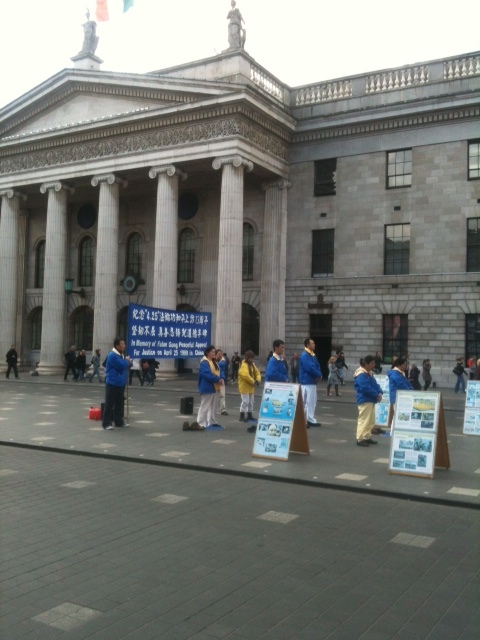 It was a demonstration against the Chinese governments ongoing persecution of Falun Gong. 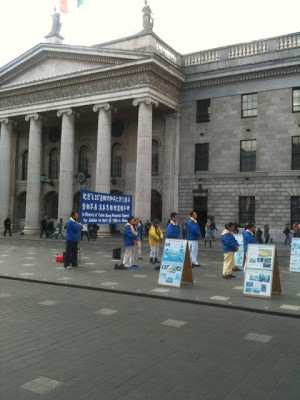 Falun Gong is a form of spiritual discipline that is combined with a martial art of sorts. I have been aware of its significance ever since writing an essay in college on the Boxer Rebellion in China in 1900. The Chinese people have a history of combining political activism with spirituality and meditation. As a result, the Chinese government have been mercilessly persecuting those involved in the practise which they deem as being anti government. 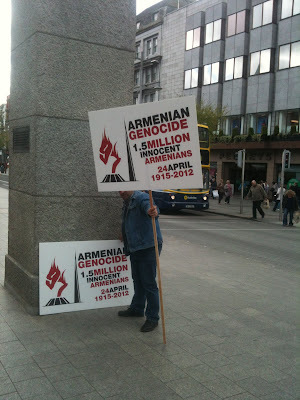 I then came across a demonstration by Armenians living in Ireland who were lobbying the Irish government to recognise the persecution of Armenians by the Turks during World War One as genocide. Perhaps as many as two million Armenians were slaughtered by the Turks in the final years of the Ottoman Empire. Recognition of the crime as genocide has become extremely controversial with the Turkish Government vehemently opposing any nations' attempt to declare it as such. 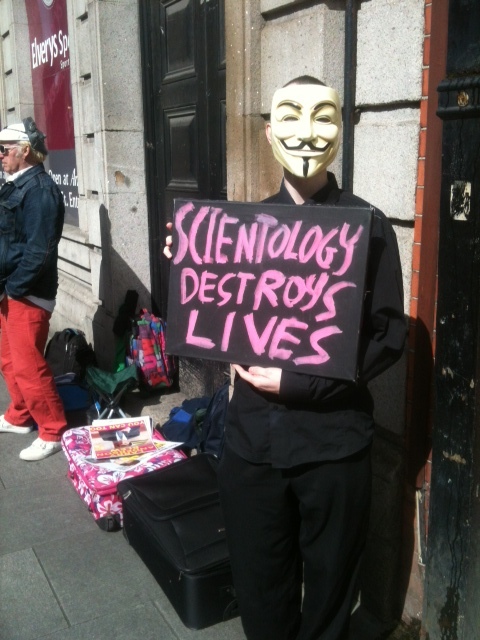 And finally, and a bit more bizarely I came across a demonstration outside the headqaurters of "Scientology Ireland" on Middle Abbey Street. The small group of demonstrators were holding banners and chanting slogans which derided scientology as a cult. I spoke to one man who told me his sister had given the organisation all her money and cut off complete contact with her family. Very troubling indeed. It is time for my annual post about Ireland's Easter Rebellion. Last weekend I attended the 96th anniversary commemoration of the 1916 Rising on O'Connell Street. I have blogged here before about the Rising and why I believe it was a noble thing In today's post I want to explain why I believe the interpretation of the Rebellion has never been more relevant than it is today. Since the financial Crisis struck in 2008 Ireland has been consumed on every level by self doubt. So much so that many even seem to question whether Independence from Britain was ever a good thing at all. It reminds me somewhat of the place America found itself in post Vietnam and Watergate when many Americans began to wonder if their country was the beacon on the hill that they had been led to believe. In Ireland, this self doubt has manifested itself with the rise of revisionist historians who regularly claim that self government could have been achieved without conflict and that our founding fathers were nationalist zealots. Obviously Ireland and the US have very different roles in the world but I think the comparison is valid as in both cases a profound sense of a need for national re-evaluation descended among the population. In the US, Ronald Regan reminded the American people that the US was essentially a noble and proud nation that is a force for good in the world. It is my hope that Fine Gael under the Leadership of Enda Kenny will do the same in Ireland over the next four years, a time which will include the 100th anniversary of the rebellion. The Flag of the Irish Republic which was raised over the GPO on Easter Monday is on display today in the Irish parliament. It is for these reasons that I believe the Irish people need to be reminded of the following. A Home Rule Bill was passed in the British House of Commons in 1914 which had it been enacted would have granted Ireland its own parliament within the United Kingdom similar to that of Scotland or Wales which would have required a permanent acceptance of the Irish people that they are British, not Irish. But let's leave that aside for a moment. I had the good fortune of meeting the late Gareth Fitzgerald a number of years ago and we discussed this issue. The famously moderate former Taoiseach said to me that had Ireland been granted Home Rule in 1914 future independence would have been impossible as our two countries would have become so intertwined on an administrative level that separation would have impractical. But even if you believe that Home Rule could have led to greater freedom and Independence consider the following. It took about 35 years of an excruciatingly slow and difficult political process for Irish Parliamentarians in London to succeed in their efforts to have a Home Rule Bill passed. The British establishment believed that they had the right to rule Ireland directly from London. When the Bill was eventually passed it was suspended due to the outbreak of World War One. So the situation in 1914 was that the Irish people would be granted limited self government, but only if they fought a World War for the British, and assuming that the British were prepared to stand up to Northern loyalists that had imported 200,000 arms from Germany in order to fight to the death to prevent the implementation of Home Rule. And also we must assume that the British were prepared to put down a British Army mutiny in Co Kildare that declared their intention to disobey orders when it came to the implementation of Home Rule. The truth is it is highly unlikely that Ireland would ever have been granted Home Rule. It was at this stage that the brave men and women of 1916 made clear that we do not want to beg on our hands and knees for limited self government in our own country which will probably be reneged on anyway. We want to take it, and we want to take it all. This they were perfectly entitled to do. It is a great example of men of vision giving history a nudge in a direction it was not supposed to go. 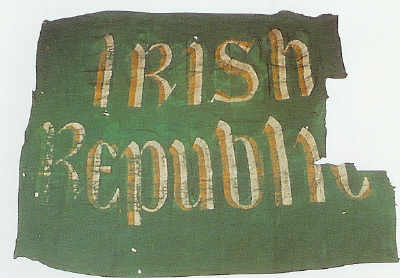 The 1916 Rising led to Irish Independence six years later. I am not a stubborn man. If Independence had led to extremism and dictatorship then I would be firmly in the revisionist camp. I suppose the ultimate question with revolutionaries is what do they do with power once they get it. Do they build or do they destroy. The Irish built a strong functioning non sectarian democracy that has lasted the test of time. I often hear revisionists say that the Poverty and emigration of the post independence years would not have happened if we remained within the crown and that the emigration of the 1930's was a terrible indictment of the independence movement. On emigration, yes it was was disastrous but we were a poor nation only 70 years out of famine. It would have been much worse if we were building walls and putting up barbed wire to keep people in. And yes, perhaps the British might have governed Ireland better. Who is to know. What is known is that the part of Ireland that remained under British administration post 1922 was governed in a sectarian fashion where as the 26 county state, flawed as it was was governed by an all inclusive parliamentary democracy and the rule of law backed up by a democratic non sectarian constitution. Ireland is now in its 91st year of democratic rule. We may not have had Nazis and Soviets knocking on our door trying to break down our democratic system but we have had militarists (both pro and anti treaty), fascists, Marxists, Provos and dissidents all hell bent on destroying Irish democracy but they have all failed. Our democratic institutions have held firm for nearly a century and that should be a source of national pride. I don't have much time for Revisionist historians. Most of them are lazy and have an axe to grind. We often debate the state of Israel on Gubu World and sometimes the phrase "self hating Jew" comes up. There exists also the persona of the self hating Irish Catholic. A controversy in brewing in the west of Ireland over plans by Galway City Council to erect a statue of Che Guevara in Galway city center. At first I ignored this issue. So the left want to put up a statue of their poster boy, so what, I thought, let the baby have his bottle. But on reflection I have joined with the thinking of those vehemently opposed to this statue. My understanding of Che Guevara is that he never held any notable position of power except for some ministerial roles which he held briefly in post revolutionary Cuba. Furthermore his exploits as a military leader and the impact he actually had on the Cuban revolution are greatly exaggerated. So part of me thought what's the harm in allowing the left to indulge in a bit of delusional hero worship. Nothing will ever convince these people of the truth that the one country where Guevara actually got his way has been run by a brutal dictatorship for fifty years. While I have never been a huge fan of many right wing Latin exiles that hang out in the US who often seem to prefer one form of autocratic rule over another I do have enormous sympathy with the hundreds of thousands of Cuban refugees, and their descendants who are entitled to be outraged at the continued glorification of a man who helped install the current Castro dynasty. 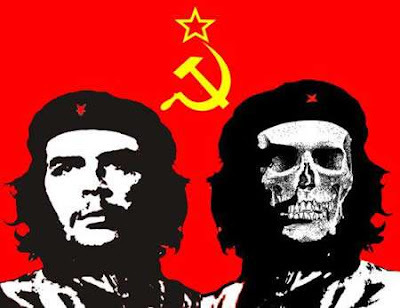 Glorifying Che out of romanticism when he stands for a symbol of tyranny which brought untold suffering to the world is irresponsible, insensitive and narrow minded. As Irish Cuban Professor at Yale Carlos Eire says, "If Galway wants to honor Che with a monument, it should also build one for Cromwell, right next to it." I believe this ad promoting EU membership has caused a bit of controversy in Brussels this week. With Croatia now set to join the EU and other Balkan countries likely to follow the powers that be in Brussels have released this ad, possibly deliberately to coincide with the 20th anniversary of the the Balkan conflict, to promote the perception that a strong united European Union can act as a bulwark to China, India and Africa. What do the learned readers of Gubu World think? 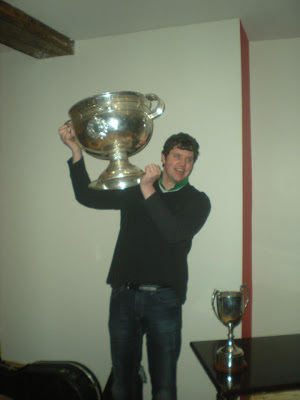 I finally got my hands on the Sam McGuire Cup at my local GAA club in Blanchardstown. Sorry about the lack of activity lately. Much more to come in the next few days.